Judge Brett Kavanaugh was confirmed to the Supreme Court yesterday by a slim majority. The battle leading up to his confirmation seemed particularly partisan. 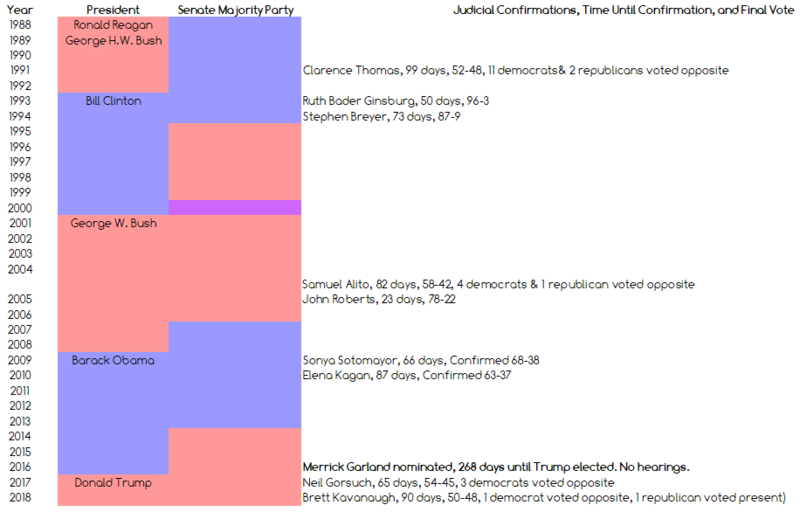 In order to better understand what was unique about Kavanaugh’s confirmation process, I threw together this timeline to help visualize the historical context of all current justices’ confirmations. I’ve included Barack Obama’s nomination of Merrick Garland in the timeline to highlight what I view as hypocritical behavior of the majority party in confirming Kavanaugh at the height of campaigning during an election year. Looking through the timeline of the current justices, Stephen Breyer, Elena Kagan, Merrick Garland, and Brett Kavanaugh were nominated during election years. Which is most fitting for comparison to Kavanaugh’s confirmation process? Breyer’s nomination in 1994 resembled Kavanaugh’s nomination in that both occurred during an election year with the nominating President and Senate majority being of the same party. However, it doesn’t look like there was much of a fight, perhaps because Breyer was replacing a justice of similar political leanings. In Kagan’s nomination in 2010, Republicans delayed mildly delayed her confirmation. However, she was ultimately confirmed by a 63-37 vote. Looking through old news reports, I see no evidence that Republicans refused to confirm Kagan during an election year, perhaps because Kagan was replacing a justice of similar political leanings. Garland’s nomination in 2016 resembles the nomination of Kavanaugh in two ways: both were during election years and both involved the possibility of a judge replacing an outgoing justice that had “opposite” political leanings (Garland vs Scalia, Kavanaugh vs Kennedy). Thus, Garland’s nomination was the recent nomination that most resembled Kavanaugh’s. Unfortunately, it looks like the majority party was inconsistent in how it applied standards in these two cases. The majority party had no problem exercising the tools in its power when it came to Supreme Court confirmations for its own benefit: delaying a confirmation and leaving a vacancy for 422 full days (longest in US history since 1846) and claiming it being due to falling on an election year, yet immediately doing the opposite two years later to fill a vacancy 30 days before midterm elections. Maybe it’s because one was a presidential election and the other was a midterm, but more likely they did what they did because they could. We can only speculate if Senate Democrats would have displayed the same hypocrisy had tables been turned, but there is no modern equivalent with parties flipped for comparison. One would have to dig further back to get a sense of how normal Senate Republican behavior for Supreme Court nominations has been.